During the First world war, Italian leaders (according to the official classification — “esploratori”, meaning “scouts”) and the destroyers”, accutrigger”) proved to be the most versatile ships, capable of solving a wide range of combat tasks. The demand for them grew steadily, but the industry in Italy has not been able to meet the demands of the fleet. 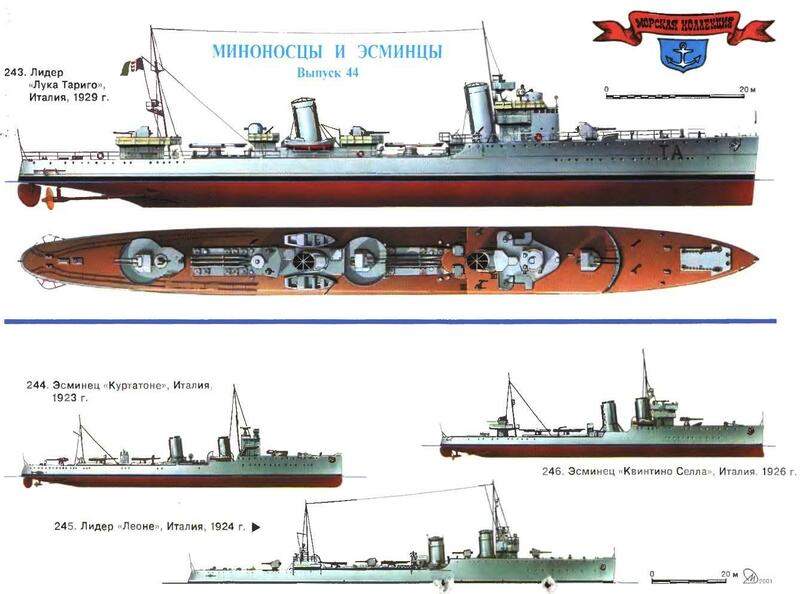 For example, eight destroyers type “Palestro” were ordered in December 1915, but the first four of them managed to lay only in the spring of 1917, and the construction of other due to the lack of shipbuilding steel dulled at all only in 1920-1921. However, by the time the project has significantly improved because of what these four destroyers has been transformed into a type of “Curtatone”. Compared to the “Palestro” (see “modelist-Konstruktor” No. 7 of 2000) “Curtatone” was somewhat larger, and its mechanisms are more powerful, but the main difference is the placement of weapons. For the first time in the history of the Italian Navy it set a three-pipe torpedo tubes strictly in the median plane, and 102-mm guns in paired installations (latest destroyers anywhere in the world, except the USA, have not yet been applied, and the Americans have mounted them on two of his destroyer only for experimental purposes). Thus, the “Curtatone” set the General rate at which matter development destroyers in Italy. of 247. The destroyer “Frecce”, Italy, 1931 r.
the standard Displacement 1225 t 2150 t full Length the greatest 96,15 m, width of 9.75 m, a draught of 3.15 m. Capacity twin-shaft steam-turbine engines of 44,000 HP. the design speed of 38 academic Armament: four 120-mm guns, two 40-mm machine gun, four 13.2-mm machine guns, two 533-mm torpedo tubes three-pipe. Just 1931-1932 built eight units of “Frecce”, “Dargo”, “Strada”, “Etta’s” and several different from the first four “V SS Folgore”, “Valeno”, “Fulmine” and “LAMPO”. All were killed during the Second world war. Podozrenie standard 1440 t 2255 t full Length the greatest 106,7 m, width of 10.15 m depth of 3.31 m. Capacity twin-shaft steam-turbine engines of 44,000 HP, speed 38 KTS. Armament: four 120-mm guns, two 40 mm gun, two 13.2-mm machine guns, two 533-mm torpedo tubes three-pipe. Only in 1934 built four units: “Maestrale”, “Cirocco”, “Trecase” and “Libeccio”. “Grecale” served in the Italian Navy until 1964 Tola; the rest died in the lobby of the Second world war. is of type “Soldier”. Displacement standard 1645. full 2590 T. maximum Length 106,7 m, beam 10,15 m draught 3.5 m. Capacity twin-shaft steam turbine 18 000 HP speed 38 knots Armament: four 120-mm guns and twelve 13.2-mm machine guns, the bottom 533-mm torpedo tubes three-pipe. Only in 1938 and 1942 constructed 17 units; two more ships remained unfinished, and one of them, the “Squadristi” in 1943 was captured by Germans, renamed TA-33, but is sunk by aircraft before the actual entry into sroi during the Second world war killed II destroyers; “Legionario”. “Mitraliera” and “Valente” in the late 1940-ies were transferred to France, and “Camicia Measure” (by that time renamed the “Argillite-II”) and “Fucilieri” of the USSR, where renamed to “Clever” and “Easy”. In the composition of the postwar Italian fleet were only “Granatiere”; it was decommissioned in 1958. The trio of “big cats” — the “Leone”, “Panther” and “tiger” — was actually intended to serve in the role of light cruisers and because of its high cost as the object for the mass of the buildings was not good. Therefore was chosen as a reasonable compromise: the destroyers, which were built in the first postwar program of the year 1922/23, was an enlarged and more speed “Curtatone” replacing 102-mm artillery, 120-mm, similar to set to “Leone”. These destroyers have introduced another important innovation — 533-mm torpedo is much more powerful than previously used 450-mm. The first four ships of the type “Quintino Sella” carrying two twin-tube torpedo tubes, the rest starting from “Nazario Sauro”— two three-pipe. Bow gun mount “Quintino Sella” and three sistership was initially odnorodnoi, but in 1929 it was replaced by the paired; all subsequent ships immediately armed with two paired. The last eight units of the family (type “Venti”, meaning “the Winds” —they got the names of the names of the winds) was characterized by a slightly increased dimensions and increased to 40 000 HP capacity mechanisms. On the test-head “Turbine” (Whirlwind) has a top speed of 39.5 knot to 3.5 knots more than was envisaged by the project. Information received about the construction in France of a large series of leaders such as “Jaguar” and “Cheetah” forced the Italians to return to the building” esploratore”. In the years 1927-1928 in five different shipyards laid from twelve ships of the type “Bow, Tarigo”, also known as the “Navigatori” (“Sailors”), because they were all named after famous mariners of the sailing era. 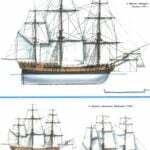 The dimensions and displacement, they approximately corresponded to the “Leone”, but was faster and carried an increased supply of oil (460 tonnes against 400 tonnes of its predecessors). Artillery weapons eased to three paired installations, but the instruments themselves have become more powerful, 50-caliber, with the elevation angle 45 degrees. Torpedo tubes caliber of 533 mm was the first three-pipe, but due to lack of torpedoes, new middle pipe soon equipped with rails for use 450-mm torpedoes. In the future, with the aim of improving the stability, the middle tube generally dismantled, leaving only the two extreme. Anti-aircraft weapons “Navigatori”, like most of their foreign counterparts at the time, looked very modest and very quickly ceased to satisfy the needs of air defence. On trials all ships in the series has reached design 38-node speed, and “Nicoloso Yes Recco” developed by 41.5 per node, and record “Alvise da Mosto” — as much of 43.5! However, the impression of a great ride quality spoils the situation with the stability of TA was assessed as clearly insufficient. Just entered service leaders had to convert, getting rid of “top” weight. So, bow superstructure reduced to a single layer, tips of the mast was replaced by a more lightweight, slightly shortened smokestacks. But still it was half-measures. Radically solve the problem of stability was only in 1939-1940, when ten ships (except “Nicoloso da Recco and Antonio Usodimare”) underwent a major modernization, in which the width was increased by 0.5 m; at the same time to improve the seaworthiness slightly raised the deck of the forecastle and bow are made sloping. In addition, the ships have replaced all worn mechanisms, strengthened anti-aircraft armament, increased fuel capacity to 680 t Standard displacement increased to 2125 tons, and speed dropped to 28 knots. By the time “navigators” were already conventional destroyers; in September 1938 from the class “exploratori” they were expelled. Similar problems arose and destroyers the next series of the “Frecce”. Their project was developed in the late 1920-ies on the basis of “Turbine”. Due to the small increase in dimensions and displacement of the designers managed to increase the power capacity by 10 percent, and the fuel supply — almost 2.5 times (640 274 t instead of t on the prototype). The armament remained the same, but the 120-mm cannon was replaced with a newer model, the same applied to the “Navigatori”. Externally, the “Frecce” stood a single chimney. This ship became the first ever single-pipe destroyer and greatly influenced the shape of future representatives of this class of combat units of the fleet. the standard Displacement of 2100 tons, full 2950 T. Length overall 120.7 m, width 12.3 m depth 3.6 m Power-shaft steam turbine 60 000 HP, speed 35 KTS. Armament: four 135-mm guns, twelve 37-mm guns, two 533-mm torpedo tubes three-pipe. All in 1942-1943 laid II units, but one of them was never completed. However, the introduction of several innovations, not all benefited. Mechanisms destroyers proved to be unreliable, and the design speed (38 knots) is unattainable. Satisfactory and poor seakeeping. Extra fuel in double bottoms required replacement of consumable oil sea water, which was extremely uncomfortable. But the biggest annoyance was clearly decreased stability, and this is especially true for the second of four ships of type V SS Folgore. at which achieve the design speed the hull width was reduced to 0.5 m. Urgently destroyers had heavier is to add approximately 100 tons of solid ballast, and to reduce the amplitude of pitching to install bilge keels. After this conversion, the speed has not exceeded 30 knots. Disadvantages destroyers of the “Frecce” helped to fix in the next four ships of the type “Maestrale”. While maintaining the same boilers and turbines, and even some reduction in the capacity of fuel tank dimensions hull was significantly increased, and the 120-mm cannon replaced by a new, lighter sample 1931. In General, the “Maestrale” was quite a good ship, which became the prototype of all subsequent series of the Italian destroyers. However, not only Italian— he made a strong impression on the delegation of the Soviet shipbuilders, and it began with a history of destroyers of the project 7 our fleet. Further evolution of the Italian “accutrigger” went the way of some increase in size, capacity mechanisms and strengthen the arms, especially anti-aircraft. Four destroyers of the type “Alfredo Oriani” is different from “Maestrale” only increased to 48 000 HP power plant and the replacement of the 40 mm anti-aircraft machine guns “Vickers” with twin 37-mm “Delusions”. Twelve ships of the type “Artillery” (known as a type of “soldiers” because they were named in honor of the representatives of different branches of the armed forces, and one of them bore the name “Camicia Nera” — “the Blackshirts”) had a slightly greater displacement and was armed with 120-mm guns of the new model. In addition, some of them, and five of their next six destroyers of the “Legionario” (2nd series “soldiers”), between the torpedo tubes installed the third — single-barrel — 120-grade paper. Were improved fire control system and strengthened anti-aircraft armament, mainly due to the installation of an additional 13.2-mm machine guns. is of type “Navigatori”. A displacement of 1900 tons standard, full 2650 T. maximum Length 107,3 m width 10,2 m, draft 3,5 m. Capacity twin-shaft steam turbine 50 000 HP speed 38 KTS. Armament: six 120-mm guns, two 40 mm anti-aircraft gun, eight 13.2-mm machine guns, two 533-mm torpedo tubes three-pipe. Just 12 units built 1929-1931. All except “Nicoloso da Recco”, died during the Second world war; the latter is decommissioned in 1954.
the standard Displacement of 890 tons, full 1229 t maximum Length of 84.7 m, beam 8 m, draft of 2.46 m. Capacity twin-shaft turbine plant 22 000 HP, speed 32 KTS. Armament: four 102-mm and two 76-mm gun, two 450 mm three-pipe torpedo tubes. Only in 1923-1924 built four units: “Curtatone”, “Castelfidardo”, “Calatafimi and Monzambano”. The first three died during the Second world war; the latter scrapped in 1951. 1771 standard Displacement tons full 2690 t maximum Length of 113.4 m, width of 10.36 m and draft of 3.1 m. Capacity twin-shaft steam turbine 42 000 HP, speed 33 KTS. Armament: eight 120-mm and two 76-mm guns, two machine guns, two 450-mm three-pipe torpedo tubes. Only in 1924 built three units: “Leone”, “Panther” and “tiger”. All were lost in 1941.
the standard Tonnage 985 tons full 1503 T. maximum Length 84,9 m, width 8.6 m, draft 2.7 m. Capacity twin-shaft turbine plant 36 000 PS speed 35 KTS. 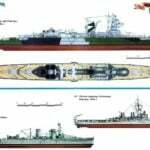 Armament: three 120-mm guns, two 40 mm gun, two 13.2-mm machine guns, two 533-mm twin-tube torpedo tubes, all in 1926-1927 built four units: “Quintino Sella”, “Bettino Ricasoli”, “Giovanni Nicotera and Francesco Krisli”. “B. Ricasoli” and “John.Nicotera” in 1940 was sold to Sweden, where under the title “Puke” and “Psilander” served until 1947; the other two died during the Second world war. In addition, 1926-1928 built 12 like-type ships (type “Nazario Sauro” and “Turbine”). The latest series of destroyers fascist Italy were the ships of the “Comandante Toscano”, named in honor of distinguished naval commanders, and is therefore usually referred to as the “Comandanti Medaglie d’oro” (“the Commanders — knights of the gold medal”). According to the project they were much enlarged “Soldati” of weapons from the four (and, as of the 9th corps — five) 135-mm cannon with a barrel length of 45 calibres in single deck installations. Significantly increased anti-aircraft armament (up to twelve 37-mm guns), the first was initially planned radar installation. Because of the heavy artillery weapons had a speed limit of 35 nodes despite the increased up to 60 000 HP capacity. In late 1942 — early 1943 on the stocks of the four shipyards have managed to lay eleven “Comandante” was planned to order nine more. But by the time of the exit of Italy from the war, the degree of readiness of these highly advanced vessels did not exceed 20 percent, and in the end none of them was never completed. During the period from 1921 to 1942 the Italian fleet has increased by 79 leaders and destroyers of national buildings, not counting the destroyers (they are in front of it), light cruisers “Capitani Romani” originally conceived as leaders and captured ships. From such an impressive Armada, the vast majority — 66 units—were killed during the Second world war. At the same time to cause any appreciable damage to the enemy, they almost failed. But so sad for the Italians statistics does not mean that you created in the Apennines of the torpedo ships were bad. Yes, they carried the weak anti-aircraft weapons, some of them had serious problems with the stability, seaworthiness, range of stroke, but these deficiencies were peculiar to almost half of the then destroyers of any Navy in the world. Italian “accutrigger” on set fighting qualities are not conceded (or almost conceded) their foreign “are high school classmates”, especially if not to forget that they were designed for action, not in the oceans, and the relatively small Mediterranean theater. As for naval architecture and systems of fire control, then the Italians in General were recognized as “trendsetters”. Well, in that they are not distinguished himself during the war, the fault is not technology, but the people: politics, Maritime command, and directly the personnel of the fleet, the level of training and certainly inferior to their adversaries, the British and the allies — the Germans.